The philosophy is quite simple: your shoes have to fit snugly and comfortably, so make sure they are tailored to your foot as much as possible. This way you will avoid blisters and other pains. If you are buying shoes for the first time you have to figure out your foot type (neutral, pronator, supinator). You can either make the wet feet test or go to a sports store where they provide machine tests. We also recommend Running Analysis where you will find out everything about your running technique. Now that you know your foot type, you can narrow down your choice. Autumn/winter shoes differ from summer/spring shoes in their outsole and material selection. The outsole has to be aggressive and provide a very good grip at an uneven, wet, and mucky terrain. Such shoes are usually labelled as all-terrain or off-road shoes. Search also for the GTX tag meaning that the shoe is made of Gore-Tex®, which stands for a waterproof and breathable fabric. You found the perfect summer running shoe and you do not want to put it aside when the weather changes? Google your shoe brand and search for the above mentioned GTX tag. Many shoe brands have the same models in the autumn/winter version, so basically you will get the same shoe, only fitter for harsh weather. Of course you can wear your summer shoes but when the ground gets slippery you will have to be very careful not to sprinkle your ankle. 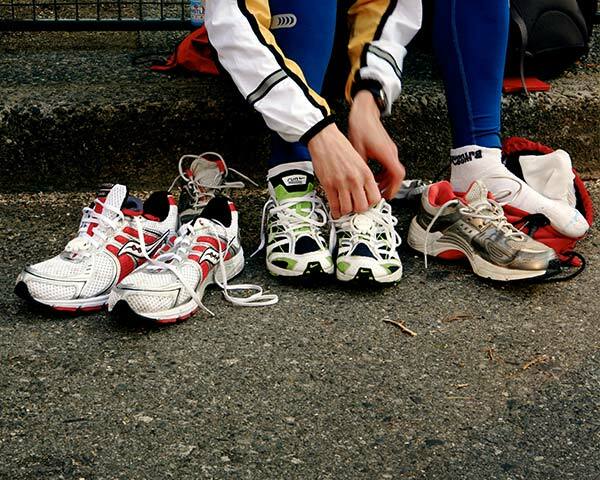 Autumn/winter-proof shoes will help you to fully concentrate only on your workout.